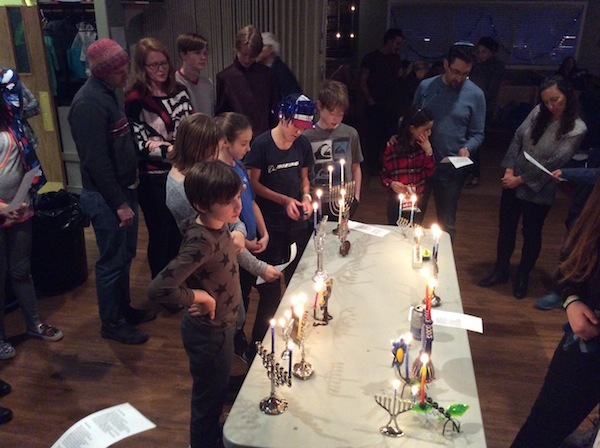 The Okanagan Jewish Community in Kelowna has been keeping a busy schedule. Bolstered by many new members who have moved to the region – word has gotten out … who wouldn’t want to live here? – the community is growing both in numbers and in strength. Traditional events such as the High Holidays – with visiting rabbis Larry and Linda Seidman from California – Sukkot and a Chanukah party attended by 80, started out our Jewish year. Of particular note was a Tu b’Shevat seder on Jan. 20, led by OJC member Barb Pullan, which was attended by 30 members. Everyone gathered to celebrate trees and discuss their importance to the preservation of life. We ate specific fruits representing those grown in Israel, drank wine or grape juice, recited blessings, told stories and sang songs. This definitely will be a repeat event in 5780. Shabbat services were led by visiting Cantor Russ Jayne from Calgary in October and November, along with other services led by local community member Evan Orloff. A Movie Night (The Boys: The Sherman Brothers Story) was presented on Nov. 9. The screening was organized by OJC member David Spevakow and took place at the Okanagan College Theatre, with almost 200 guests in attendance. We hope to continue the movie nights on a regular basis. Coffee, cake and cultural anthropology talks. I gave the first talk, on my experience meeting with the Jews in Gondar, Ethiopia. The second session was presented by Murray Oppertshauser, a retired Canadian diplomat, who spoke about his many postings throughout the world. Further talks are planned. Several intercultural “meet and greets” have been planned with various cultural/ethnic groups in town. The OJC participated in Taste of Home, a Kelowna community event, in which various ethnic communities in the city participated by selling a sampling of their ethnic food, and with ethnic dancing. We contributed 340 cheese knishes prepared by our members under the direction of Barb Finkleman. Our local Israeli dance group provided the entertainment. Future events include a ball hockey tournament, Purim, Passover, regular meetings of the Ladies Group, the continuation of the Hebrew school, and our annual golf tournament in the summer. The OJC is searching for a full-time resident rabbi. 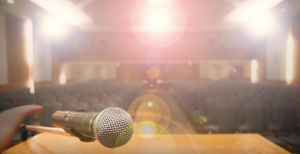 We are in the process of having several candidates come out for a Shabbat weekend, after which the community will decide which spiritual leader best fits our needs. If you’re visiting Kelowna or, better still, moving here, contact the OJC at 250-862-2305 or [email protected]. Steven Finkleman is one of the original members of the Okanagan Jewish Community, having arrived in 1982. He has acquired lots of memories over the years. Currently retired, he has been serving as the president of the OJC since October 2018. Tu b’Shevat, the 15th of the Hebrew month of Shevat, begins at sunset Jan. 30. The Tu comes from the Hebrew letters tet and vav, which add up to 15, and the festival is also called the Holiday of the Trees and the Holiday of Fruit. Tu b’Shevat is not mentioned in the Torah but in the Mishnah, the written combination of texts of Jewish oral traditions compiled in the third century CE. It is also mentioned in the Talmud, which is both the Mishnah and the Gemara, the elucidation of the Mishnah. Beginning at the end of the 17th century, eating fruit became a custom associated with Tu b’Shevat, frequently the sheva minim, the seven fruits mentioned in Deuteronomy (Devarim), grown in Eretz Yisrael – wheat, barley, grapes, figs, pomegranates, olives and dates. It is also customary to eat nuts on the holiday. Here are some recipes to help you celebrate. Preheat oven to 350°F. Grease a cake pan or a square pan. Stir together flour and baking soda. In a mixer, beat margarine or oil, sugar, almond extract and eggs. Stir in flour mixture alternately with buttermilk, yogurt or non-dairy creamer and blend. Pour into greased bake pan. Sprinkle top with almonds. Bake for 25 to 30 minutes or until a pick inserted into the centre comes out clean. Preheat oven to 375°F. Grease a cake pan. In a mixing bowl, toss dates and nuts with carob powder. Separate eggs, adding yolks to mixing bowl. Place whites in a separate bowl and beat with cream of tartar until they hold stiff peaks. Add to date-nuts-carob-egg yolk mixture and blend. Spoon into greased cake pan and place in oven for 15 to 25 minutes. Test every five minutes with a pick inserted into the centre until it comes out clean. Stuff each fig with one piece orange zest and one almond. Pack into a small baking dish that will hold them tightly in one layer. Pour wine over figs. Place another glass baking dish on top to weigh them down and to get the figs flat and covered in wine. Remove that dish, and then place the first baking dish into a second dish, then put in the oven. Bake 20 minutes. On Tu b’Shevat, when we look down at Mother Earth, instead of up, to find the Creator of All, the rabbis like to tell the story of Willow. Once, many Tu b’Shevats ago, a young tree named Willow grew in the forest. The wind that cooled the forest in the summer and carried the gossip of the blue jays had brought her seed to this shady spot in the forest. It was not the best location, since it was next to a much older oak tree, who towered over Willow like a big brother. He was so high and leafy and strong that most of the birds chose him as a nesting place; Willow only had a couple of caterpillars, who lived in one of her leaves. But, what bothered her most was that this jolly green giant blocked most of her sky. “If I had three wishes like you get in fairy tales, I’d wish for an open spot on the meadow, an open spot on the meadow, an open spot on the meadow,” murmured Willow when the wind blew through her leaves. This little tree didn’t want any big brother blocking her sun and rain. All summer long, Willow twisted and bent to find the sun. Trees need sun like we need love, or they dry up and die. But that tall oak decorated with birds’ nests blocked the direct rays. Only pale yellow fingers of light touched Willow. And, when fall came and most of the trees began their six months of rest, Willow slept poorly because huge acorns rained down on her from the heavy limbs of the oak. Like hail they fell. Each one could rip off a leaf. After this hailstorm of acorns, she dozed. But not for long, for soon a blizzard of leaves from the giant Oak overwhelmed her. They piled up on the forest floor almost taller than her. She could barely breathe. Willow didn’t know how lucky she was to have a big sheltering friend. Young trees who tried to grow in open places were often washed into the brook by the rainstorms. And, when it didn’t rain, the sun burned them up and turned them into dead, dry sticks. And, without a big tree to shield you from the wind, one wild blast and you could lose every leaf you own. As Willow continued to doze the fall away, she was awakened suddenly one day from her favourite dream in which lightning toppled the big oak, bird nests and all, and left a big, blue, empty space in the sky. She heard voices – happy, laughing voices of children. Before Willow was fully awake, these children, with the help of a sharp shovel, had pried her roots from the earth and dumped her in a wagon. What an experience. Lying on her side, her roots all exposed. The movement made her dizzy. Soon, she was well out of the forest – even past the brook. Eventually, the wagon stopped and the children put her back into the earth. Her new home was their backyard. But soon she began to miss the big oak – the sun was awful hot. And, when the clouds came to block it, that meant rain would follow. A little rain tasted good, but sometimes the rain turned the backyard into a swamp that suffocated her roots. She was scared. It was no fun being the only tree in the yard, thought Willow. It was lonesome, too. There was nobody to talk to except the telephone pole on the street. And he just made a shrill noise in the wind. What could a dead telephone pole say to a young tree? But, when the breeze from the forest fanned her branches, she could almost hear the gossip of the blue jays and the news of her old friends. As the years passed, something happened that the other young trees in the forest had whispered about. Willow grew seeds, and the willing wind soon carried them away and one of them happily arrived at the very spot where Willow had lived – beneath the giant oak. The oak kept the sun from burning the new willow up. He gently filtered the rain and never let the wind pull at the little sister that grew under the shelter of his limbs. Big brothers aren’t all bad. As part of a nationwide tour, with stops in Ontario, Manitoba, Alberta and British Columbia, Hanni Arnon, executive director of Arava International Centre for Agriculture Training (AICAT) of the Arava Development Co., introduced the training program to Canadian audiences. In 1994, Arnon founded AICAT. The goal of the centre is to educate students from countries around the world on how to form successful agricultural businesses. Her cross-Canada talks – Feeding the World through Education – were organized by Jewish National Fund of Canada, its local branches and support from various other local Jewish organizations. In her presentation in Winnipeg, Arnon shared her personal story about having been born and raised in Jerusalem. About 30 years ago, she chose to follow her dream and move with her husband, Moti, to the Arava region. Some 900 families live in the central Arava, which is a desert. Given the harsh climate, general lack and poor quality of water, residents had little choice but to find creative solutions and overcome the daily difficulties they encountered. They have gathered more than 50 years of experience and research, with science as the foundation. The global population is reaching more than seven billion, including 800 million people in poverty. Arnon is looking for a way to feed them by focusing on collaboration and the transfer of knowledge, which she feels will lead to empowerment and the opening of opportunities. She acknowledged that knowledge itself is not enough, that it needs to be coupled with training. AICAT provides students with practical knowledge in everything from vegetable production to business management, marketing, research, technology and strategic thinking. The goal is for students to return home to “establish their own agriculture business and improve their farms,” said Arnon. According to Arnon, AICAT – which has 40,000 graduates to date – teaches the most important lesson – that if you want something earnestly enough, you can make it happen. Every year, she said, she sees how, after 11 months, the students have a light in their eyes and are keen to apply the new ideas to helping their home countries. When Arnon was asked a question about cooperation with the Jordanians, she spoke about the different ways AICAT works with neighboring farmers. “Just to make sure you understand how close we are, the place where our fields end, this is the border,” she said. “It’s an open border with no fence. We have a peace agreement, so it’s a quiet border. We send our expertise to support farmers in Jordan. We are open for any collaboration with the Jordanians and would especially like cooperation with our neighbors. As for the students involved in the project, Arnon noted that they pay for a one-way ticket to Israel, a medical exam and a passport. They can work while in Israel to earn their fare back home and tuition fees, while also taking home with them $2,000-$3,000 to help put into practice what they have learned. The original inspiration for AICAT was the need to teach Thai workers in the 1990s about agricultural systems. Arnon, having been trained as a teacher for that work, immediately felt that a school should be created to teach the subject on an ongoing basis to as many students as possible. AICAT presently teaches about 1,200 students per year, but Arnon is hoping to double that number with a new campus that will break ground in March. As for funding, no government funding or support is provided, apart from providing the students with visas. It is JNF that provides support for facilities, dormitories and programs. Ariel Karabelnicoff, director of JNF Manitoba and Saskatchewan, closed the Winnipeg event by sharing that the school has 80 students from Indonesia, an Islamic country with no diplomatic ties with Israel. While in Winnipeg, Arnon also took time to speak to University of Manitoba students and visited the Canadian Museum of Human Rights. In Vancouver, hosted by JNF Pacific Region, she spoke at Temple Sholom, Beth Israel and Schara Tzedeck. The talks were timed with the celebration of Tu b’Shevat and JNF’s fundraising campaign for a 6.5-kilometre park in Eilat. For more information on the campaign, email [email protected] or call 604-257-5155. Until Jews began to return to Eretz Israel in 1948, no one thought of them as farmers. For nearly 2,000 years, we had been dispersed throughout the world and, in many places, were not permitted to own land or engage in agriculture. But, in ancient Palestine, we were an agricultural people. We treasured the olive tree, the grape vine and the date palm. The Bible encouraged us to plant “all manner of trees” and forbade the destruction of trees of a conquered land. Just as we believe that on the first day of the seventh month, Rosh Hashanah, we are judged and our fate for the coming year is inscribed in the Book of Life, so we are taught to believe that trees are similarly judged on the New Year of the Trees, Tu b’Shevat (the 15th day of Shevat, this year Jan. 25), the first day of spring. This semi-holiday has always been associated with tree planting. In ancient times, one planted a tree at the birth of a child – cedar for a boy, cypress for a girl. Special care was given to these trees on Tu b’Shevat and, when the children married, branches of their own trees were cut for the chuppah (wedding canopy). It is said that, on the 15th day of Shevat, the sap begins to rise in the fruit trees in Israel. So, we partake of the fruits of the land: apples, almonds, carobs, figs, nuts, dates and pomegranates. The pious stay up very late on the eve of the holiday reciting passages from the Torah that deal with trees and the fertility of the earth. We read the story of how trees and plants were created (Genesis 1:11-18), the divine promise of abundance as a reward for keeping the commandments (Leviticus 26:3-18 and Deuteronomy 8:1-10) and the parable of the spreading vine, which symbolizes the people of Israel (Ezekiel 17). Each of the fruits has symbolic meaning. The rosy apple stands for G-d’s glowing splendor; the nut represents the three kinds of Jews – hard, medium and soft. The almond stands for swift divine retribution, for it blossoms more quickly than other trees. The fig means peace and prosperity, and the humble carob stands for humility, a necessary element of penitence. Dvora Waysman is a Jerusalem-based author. She can be contacted at [email protected] or through her blog dvorawaysman.com. In honor of Tu b’Shevat on Feb. 3-4, why not try some variety to celebrate the New Year of the Trees? One usually thinks of dates, figs and carob on this holiday, specifically the species of fruits that are listed in the Torah as native to Eretz Yisrael. In Israel today, sometimes we augment that with other in-season fruits, like apples, persimmons, strawberries (though beautiful, they are expensive!) or varieties of delicious citrus. Here are some recipes using oranges. Preheat oven to 350°F. Grease a baking dish. Heat margarine and oil in a frying pan and brown chicken. Place in a baking dish. Add orange juice, chicken soup, cornstarch, onion and lemon juice to frying pan and cook, stirring, until sauce thickens. Pour over chicken. Cover and bake 45 minutes. Garnish with dates and orange slices, cover and bake at least 15 minutes or until chicken is done. Serve with rice. The dressing is good on a salad with lettuce, avocado and grapefruit. Combine oil, orange juice, sugar and mustard in a jar. Preheat oven to 350°F. Grease a cake pan, two loaf pans or place mini papers in a mini-muffin pan and spray with vegetable spray. Place orange pieces, oil, eggs and brown sugar in a mixer or food processor and blend a few seconds. Add ginger, cinnamon, vanilla, flour, baking powder and non-dairy creamer and blend. Spoon into baking pans. Bake 25 minutes or until a toothpick inserted in the centre comes out clean. Cream sugar and margarine with eggs. Stir in orange juice and orange peel. Add flour, baking soda and nuts and mix well. Drop by teaspoon onto cookie sheets. Bake 10 minutes or until golden brown. Tu b’Shevat, which falls this year on Feb. 3-4, marks the end of the rainy season in Israel. Buds are beginning to appear on the trees, and the blossoming almond trees, the harbinger of spring, have begun to dot the landscape. So, on the 15th day of the Hebrew month of Shevat, we celebrate the yearly cycle for the growth of trees in Eretz Israel. According to Jewish mystical tradition, Tu b’Shevat is the day when G-d renews sustenance and the “life-cycle” of the trees, when the sap starts to rise. There are many customs to remind us of the meaning of this day, including a Tu b’Shevat seder, not unlike the ritual meal we have on Passover. On Tu b’Shevat, fruit trees were measured for growth in order to calculate the annual tithe to the Temple. Even long after the Temple was destroyed, this seder was a new way to reaffirm the spiritual bond with the land in celebration of the approach of spring and the fruit of the earth. This ancient tradition was developed in Safed, the seat of kabbalistic studies in the 16th century. Traditionally, we eat nuts and the fruits for which the Torah praises the Land of Israel, including grapes, figs and pomegranates, olives and dates. 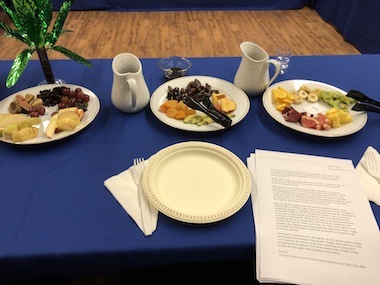 The table is set with a snowy white tablecloth, candles, fruit and nuts, and the sharing of prayers, readings and songs. It is traditional to enjoy four cups of wine, like on Passover. Those glasses of wine can be paired with a corresponding fruit and divided into ascending levels of spirituality. The first cup, therefore, is often white wine, symbolizing winter, accompanied by a fruit that needs a protective covering, such as oranges or almonds. The second cup is white wine mixed with a small amount of red, signifying spring, the budding of new life. This glass is served with olives, apples, peaches and dates: the outer layer is eaten, yet the heart is protected and has within it the seed of new life. The third cup is red wine with a small amount of white mixed in. This is the symbol of summer and a perfect world in which nothing is wasted. With this, fruits such as figs, grapes and berries are eaten. These are considered to symbolize the highest level of spiritual openness. The fourth cup is red wine only, representing fertility and the bounty of the autumnal crops. What else happens on Tu b’Shevat? Very little religiously, but a lovely ritual has arisen in Israel, one that’s now been adopted all over the Jewish world. It is a popular observance to plant trees, one of the greatest mitzvot we can perform. Trees have great significance in Judaism. This Tu b’Shevat, however, we are still in a Shmita (jubilee) year in Israel; the land is resting, so no plantings will take place. Trees hold a special place in Judaism. It is written in Deuteronomy: “When you besiege a city for many days to wage war against it to seize it, don’t destroy its trees….” In the Midrash Shmuel on Pirkei Avot 3:24, it is written that man is like a tree in that his good deeds are his produce, his “fruits,” and his arms and legs the “branches,” which bear these fruits. He is, however, an “upside-down tree,” for his head is rooted in the heavens, nestled in the spiritual soils of the Eternal, and nourished by his connection to his Creator. Dvora Waysman is the author of 13 books, which are available through Amazon, or from the author at [email protected]. Her website is dvorawaysman.com.